Spark timer for using in producing equally timed impulses from 2,5 to 28 per second. Consists of an electrically maintained vibrating bar provided with electrical contacts for making and breaking a circuit at equal intervals, the length of one interval being the full period of vibration of the bar. 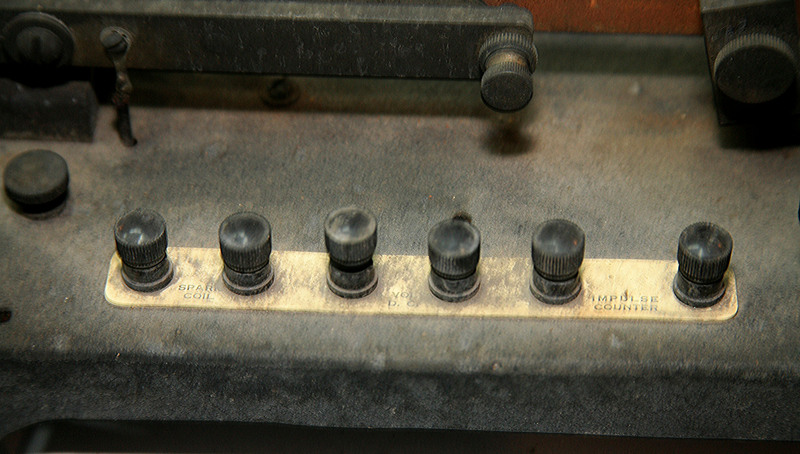 Two sets of contacts are provided, one of which is used in maintaining the vibration by opening and closing the circuit through an electromagnet; the other set is, independent of and insulated on one side from the first, is available for opening and closing a second circuit (such as a primary of a spark coil) for producing the timed sparks. The electromagnet is adjustable by a slow motion screw fro control of the amplitude. Two interchangeable bars are provided, on light and one heavy, witch, with the aid of two loading masses that may be clamped to the bars, may be adjusted to vibrate at these frequencies. One bar is missing. The entire mechanism is secured to a substantial cast iron base, finished in black wrinkle enamel. The driving circuit is independent of the circuit for actuating the spark inductor, and biding posts are provided for the several circuits. 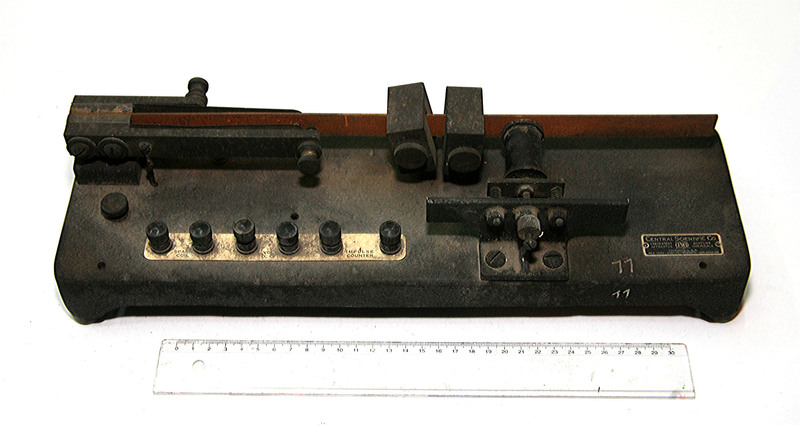 In use, the Spark Times is connected to spark coil (2 most left biding posts), batteries (2 medium bidding posts), and No.73305 Impulse Counter (2 most right bidding posts).